Updated: This evening, as we learn about the death of Osama bin Laden, we’re seeing firsthand what happens when the real-time, immediate notifications of Facebook and Twitter meet real-world events. It’s not the first time, but the death of Osama Bin Laden is truly a global event in the way that Prince William and Kate Middleton’s marriage on Friday was not, or even what the protests in Egypt and Libya are not. While there are doubtless plenty of Americans who will wake up tomorrow to be greeted with the news that a special operations mission has killed bin Laden in Abbottabad, Pakistan, millions discovered the news Sunday night on Twitter or Facebook. And while they may have tuned into the news on television, many more watched the live stream from the White House on the web, or streamed it from Al-Jazeera, CNN (s twx) or countless other sites offering the news in real time. And some likely followed it via Twitter for far longer than the brief address. Update: After President Obama’s speech last night, Twitter said it was fielding about 4,000 tweets a second. From the time of the reported first tweet on the topic, coming from @KeithUrbahn who lists himself as “Chief of Staff, Office of Donald Rumsfeld, Navy Reserve intel officer, and owner of two miniature dachshunds. Opinions are my own,” which was posted around 10:25 p.m. EDT, Twittersphere and Facebook denizens followed a compressed news cycle as folks waited for confirmation from someone, anyone. Excitement. These tweets quickly followed expressing a tone of excitement and the thrill of being first to report potentially huge news. Uncertainty. Almost as fast as the news hit, the doubters came out questioning whether the news was legitimate or not. Some were waiting for the news venue of their choice to weigh in, while others were waiting for the coming statement from the president. Searching for Validation. Torn between wanting the news to be true and the fear of being wrong, folks turned either reverential in their love of Al-Jazeera or the New York Times (s nyt) or whoever was already reporting details or scornful of those who might have been more cautious. Confirmation. The White House confirmed, and now the search for meaning, data and tasteless jokes will begin in earnest. Jokes, Profits and Platitudes. Once confirmed, the platitudes, jokes and attempts to profit either via owning a domain, a twitter identity (say hello to @ghostosama) or the umpteenth joke about the birthers now asking for a long form death certificate are free to escalate. 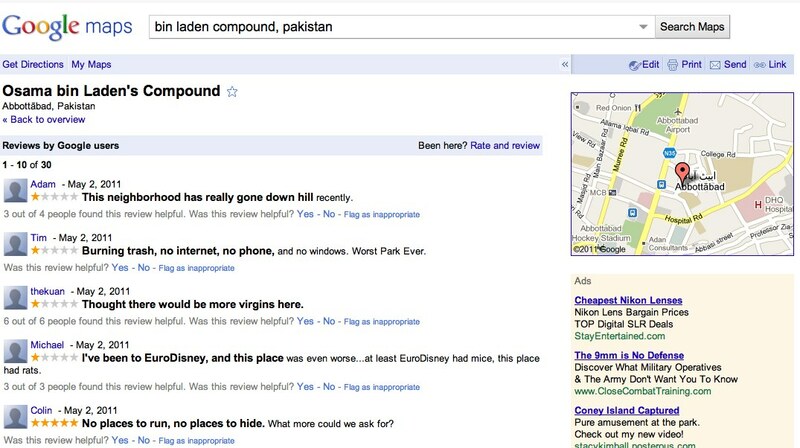 Meanwhile Google (s goog) updates its Maps to show the location where bin Laden was killed. Action. This is where Facebook and social media really shine. From tweets about people seeking more information from friends to those seeking to find out if others are meeting at Ground Zero by checking out a live web cam of the site, people now can learn about news and do something. Real Analysis. Not on Twitter, unless it’s via a link to a blog or a newspaper. What insight on geopolitics can one really offer in 140 characters? Maybe it’s time to recognize these stages, or come up with more thoughtful ones, so we can recognize where we are when we tune into this cycle and behave accordingly. As journalists, we often get scoops or hear of news and have to make a similar set of judgments before reporting it, but on Twitter, what often starts out as gossip now has the weight of news. As recipients, we have no way to judge at first glance though if it’s real or wishful thinking. Perhaps it’s time we gave ourselves a better set of tools? With additional reporting by Cyndy Aleo. Here in Colombia we had been also through these steps in the information process nor only in this success but in another notices, even we have an example of a media falling in a error because of the speed of the internet. This happened last year when lasillavacia.com said that Alfonso cano, leader of the FARC, was dead.after a few minutes, the Colombian government unauthorised that information. SInce that the media credibility has fallen. This topic will remain alive for rest of the whole next week on media. I heard today that someone Tweeted about the black hawk helicopters hovering over the neighbouring house… A local. I would be scared and running for the basement, or just running, if I saw foreign armed forces next door – not whipin’ out the cell phone to Tweet about it! You and I were thinking the same things! Your post is much more comprehensive and I really enjoyed reading it! I thought the exact same things, especially the doubting part. I couldn’t believe it was real at first. This is excellent! And so very true. I even checked out the timeline of my friend’s posts to FB, and they follow these stages exactly! Twitter users are now becoming citizen journalists and what I found interesting about your post is that although news stories are breaking first on social media, until there is confirmation from official news sources people are not 100% trusting of this new source of information. However, inaccurate commentary often ensues and many of the facts become clouded, and then as the day has gone on many are starting to question the validity of the event due to the rumours flying around which has began the inevitable conspiracy theories. But, in the UK BBC news was half an hour behind Twitter to announce the death and this could be due to the fact that without any real confirmation they cannot broadcast the story, therefore Twitter as Twitter is continuing to follow these rules it will be first to break any story. True, but in the more cloistered world of journalism, a reporter could (sometimes) afford to wait 30 minutes to keep sourcing so he or she could ensure being accurate. Now folks must weigh being first or being accurate. And on Twitter many don’t weigh that at all. They just report. Exactly my thoughts. I always enter with an extreme amount of scepticism when I hear of a major event. Generally I look to BBC’s website or The Guardian for validation. Great post. Yes, it’s amazing how social media has really changed how we learn about and interact with the news. You describe it quite well. What interests me most is how one time my husband and I heard from a RELIABLE source within the White House Press Corps that bin Laden was killed las tweek and they had been waiting for the DNA proff and they just got it last night. The suddenly, over night he was killed only yesterday and the true info about the timing has vanished. 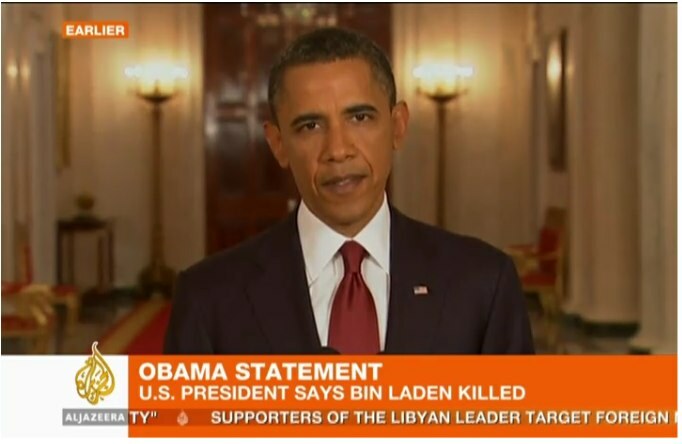 And By the Way America….why are we so happy about the death of one man? When they bring our sons and daughters home, then we can rejoice and celebrate. But for now, this is but one person and it seems that the media brodacaster how “jubulant” we are is just taunting the rest of the terrorists in the world to hate us and want us dead even more. Just thinkin’…..
Wow! Props to Twitter who handled all the crazy traffic with no problem. The Royal wedding was just a dry run. Great article. Social media is definately a part of the news cycle. I was away from a television and recieved the news via text. I immediately checked CNN and then Facebook and Twitter. I remember at one point between 1045pm and 11pm (just a few minutes after the news was released, and before the press conference), I counted more than 50 Facebook statuses on my homepage about Osama! It was amazing. You are oh so right….I myself tweeted and fbeed about the news since I noticed that the local press had not covered it. Interesting post, and definitely something to think about. I was on Twitter when the news came out, and my TV wasn’t working so I was getting all my info there. Then later I read news articles and watched videos of Obama’s speech, but it was certainly a different experience than turning on the TV and watching the SAME thing as everyone else. I absolutely love how social media has influenced how we receive the news. I’m not on twitter so the first I heard of it was when I got up in the middle of the night and checked wordpress on the way back to bed. As a result, I found out about 6 hours earlier than I would have with a newspaper. It is also great of you to mention that different social medias work for certain ways to handle news. Analysis is not going to come by twitter, but by newspapers, the news, and blogs. Nice post! Yes, we certainly live in a new age of information. We are living in a historical epoch, one that is changing the world, changing the way people think, changing the way we interact internationally and subculturally. We are reshaping ourselves, remapping our brains, restructuring our schema. We are reprogramming our internal GPS’s. It is all so fascinating, so exciting to be a part of. A period we have to embrace personally with a global-humanity point of view. Great post. It’s always wise to think twice about what you hear on Twitter and Facebook and wait for more credible source to be certain. This new about Bin Laden was created in Photoshop (not even a short video about it). those “demotivational poster” images are more reliable than this. Americans would would prove more productive if they worked toward an end to THREE COSTLY AND DEADLY WARS that can be linked to the chaos created by Osama bin Laden and now have neither purpose nor justification. The cycle of violence in the digital age seems to do even more damage. Fascinating analysis of news via social media. Congrats on being FP-ed! Interesting analysis – jokes are indeed part of the process! I thought the chanting that began at the Mets v. Yankees game illustrated the power of FB in transmitting news — incredible how quickly sentiment spread! What do you mean from cousin obama? It was a joke, Irfan. Way to dig out a nice post on Sunday night, Stacy. Sleep well.